For centuries nomadic native Americans occupied the central wilderness of Greene County. The Iroquois, Esopus and other tribes fished the streams and hunted for game to sustain themselves. By the mid 1700’s, however, land titles were obtained by European settlers and Colonial Districts established. Although most early settlement was scattered, consisting of single log homes, one settler of distinction came here in 1765 and settled a large tract of land along the Catskill Creek. James Barker and his wife Elizabeth Wooer brought 23 tenant farm families here from London, England. He would name the 6000-acre settlement “Woodstock” after the English Manor house in which he was born. Despite the physical hardships and the death of his infant son to illness, the Barkers and the settlement prospered. Families were raised and their influence spread throughout the surrounding area. After the American Revolution, many New England families moved West to purchase affordable farmland. Now safe from both British forces and occasional attacks by aggressive Indians, the new settlers started critical businesses for a growing settlement and their numbers increased many folds. An Iron Forge was established along the Shingle Kill in Purling in 1788, utilizing charcoal iron shipped from Ancram in Columbia County to form useful implements for local farmers. It is said that the Shingle Kill was named for its abundant supply of adjacent woodland, providing the raw materials for the manufacture of the essential roofing material. The construction of the Susquehannah Turnpike in 1801 created a conduit of travel for people and goods through the area. This influenced the formation of what is now Cairo Village into a destination point, with early inns, blacksmiths and other needed services. Early industries, which found success in the growing town, included tanning of hides, utilizing the tannic acid from the then abundant Hemlock. Ira Day and Daniel Sayre each established early tanneries but both succumbed to the over harvesting of their main resource. Other small but essential businesses included many sawmills, Montgomery Stevens distillery and Judge Moses Austin’s wool factory. Farming long remained the predominant occupation, as the town was rich in arable land, found mostly in the valleys and along the streams. The Greene County agricultural Society established a County Fair here in 1819 with horse racing as the main attraction to supplement the judging of livestock and baked goods. The Town of Cairo was officially established as a place as Canton on March 26, 1803, taking parts of Coxsackie, Freehold, and Catskill. Canton would come to include the hamlets of South Cairo, Purling, Round Top, Acra, and Gayhead. The name was changed on April 6, 1808 to Cairo on the suggestion of a then prominent merchant, Ashbel Stanley who had moved here from Coventry, Connecticut. There are conflicting theories as to why the name change was chosen. Some believe that the profile of the Blackhead Mountain range suggested the appearance of the mighty pyramids. (The pronunciation was most likely then similar to that of the Egyptian City and later Anglicized to “Kay-ro,” like the syrup.) Others feel it was simply a popular idea of the early 19th century to name towns after ancient cities of prominence. Cairo’s original name of Canton might have been inspired by the Chinese City made famous for its export tableware to the American market. Speculation on why the change was needed suggests the establishment of a post office here revealed an existing “Canton” already established in St. Lawrence County in 1805. With a scattering of just about 200 early settlers, many of which New England families such as the Allertons, Brewsters, and Olmsteads, the population soon swelled to over 2000 inhabitants by 1810. The education of those early settlers was limited to several months a year, in a primitive village facility, erected in 1795, on present day Bross Street. Religious meetings were held in church members’ homes until structures were built for each of these functions. A post office was established in Cairo village, near the present-day Memorial Fountain, in the early 19th century. Original elected officers of the town included Daniel Sayre as the first Supervisor and James Gale the first Town Clerk. The first annual meeting took place at the home of widow Mary Carbine on March 26, 1803. By 1825 Cairo became the chosen location for a County-run Poor House, primarily because of its central location and availability of acreage. Despite the early success of small manufacturing, farming in the fertile lowlands continued to predominate local activity well into the 19th century. Eventually the technological advancements made during the Civil War allowed the rapidly growing rail industry to encroach west from the Hudson River shoreline. Although the pioneer Canajoharie & Catskill Railroad had brought small numbers of passengers and freight near the village from about 1838 to 1840, its fate had been sealed by its mechanical limitations as well as competition from Albany interests and the subsequent lack of financial support. Eventually the Catskill Mountain Railroad would establish a branch running from Catskill Landing west to Cairo. The railroad directors saw the extension as a way to tap business from local fruit growers, bluestone mines, not to mention a growing tourist trade. The line opened in June of 1885 and led to the establishment of much travel related businesses along Main Street. This pattern continued until the early 20th century, which marked the gradual decline of horse-drawn transportation and its replacement, by the automobile. The “horseless carriage” would forever change the way Americans lived and tourist destinations like Cairo would benefit from this newfound mobility. 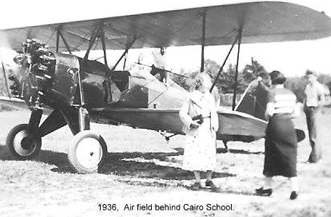 But this proved fatal to the local railroad industry and the Cairo Railroad would close after the 1918 summer season. Iron from the railway was used for the efforts of America’s First World War. Visitors now arrived in individual autos, spawning the growth of filling stations and roadside souvenir stands. The face of tourism was also changing. Contenporary visitors wanted valued-added features. Vacation options were expanding with competitive travel sites and the establsihment of large amusement parks, casinos and other attractions.